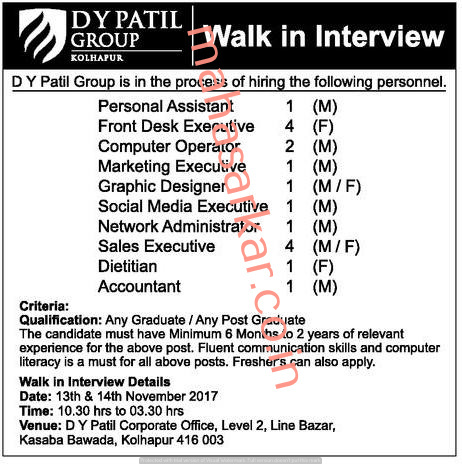 DYPATIL Kolhapur (DY Patil Group), Kolhapur Published Job Notification for 17 Personal Assistant – Computer Operator & More Posts. Candidates who wish to apply must look at DYPATIL Kolhapur Recruitment 2017. Eligible candidates can join Walk-in Interview on 13th & 14th November 2017. Interested & Eligible candidates may attend for walk in interview along with all the documents addressed at DY Patil Corporate office, Level 2,Line Bazar, Kasaba Bawada, Kolhapur, Maharashtra 416003. Walk-in Interview at DY Patil Group which candidates should be remember as follows. Walk-in Interview on: 13th & 14th November 2017.